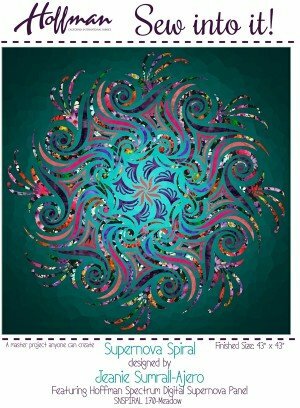 Supernova Spiral kit featuring fabrics from the Supernova signature digital-print collection (and pattern) by Jeanie Sumrall-Ajero of Kaleidoscope Collections, along with selected Mystic Meadow digital-print fabrics, and Hoffman Bali Watercolors. 43″ x 43″ completed quilt top. Precision-cut and prefused applique pieces. Easy-to-follow instructions by Jeanie. Appropriate for advanced beginner.